The aroma of Pan Seared Scallops (click on bolded words) floated from my kitchen into our hallway. Last night that was an indication that dinner was almost ready. Served along with a microwaved “baked potato" and a fresh fruit salad this dinner was easy and quick to prepare and tasted delicious! 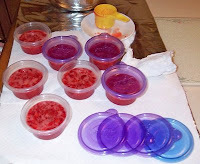 This afternoon the second batch of Strawberry Freezer Jam (click on bolded words) was prepared. The mission is now complete! Another seven labelled Ziploc freezer containers of the delicious jam is now sitting on our table. It will remain there undisturbed for 24 hours. Then, I will place it in our freezer to be enjoyed all year. The Blueberry Freezer Jam and the Peach Freezer Jam will be prepared when those fruits are in season. The packages of Certo, Ziploc containers and sugar are waiting to be used. Summer is here! Around lunchtime today my husband & I decided to drive to the local strawberry fields to purchase some quarts of strawberries. We would prepare and freeze them to enjoy later this year. There are times when every day aches encourage an individual to seek another method of undertaking a mission. The mission was placing prepared bags of strawberries in our freezer and making freezer jam tomorrow. All year we enjoy defrosted strawberries as a topping on Awesome Oatmeal Pancakes or Strawberry Freezer Jam on toast or with Yummy Yogurt. A supply of strawberries was needed, but purchasing the red, ripened, fresh fruit was a better option for us than picking the berries ourselves. At Meadowbrook Farm in East Longmeadow, MA we purchased an overflowing 8-quart container for $28. Individual quarts were also available for $4.50/quart. Later this afternoon after some prep work, eleven Ziploc packages containing the newly picked, fragrant, luscious berries were placed on the top shelf of our freezer. Tomorrow, the first batch of Strawberry Freezer Jam will be prepared. Next week we will return to Meadowbrook Farm to purchase another flat of the fresh, red, juicy, delicious strawberries. Yes, we also enjoy eating them, now. Summer is here! On these hot and humid evenings a delicious, multi-colored cold salad is always welcome on our dinner table. Tangy Tortellini Salad is prepared with a 12-ounce package of frozen tri-colored Cheese Tortellini, Italian Salad Dressing and a few optional additions. It is easy to make and tastes yummy! Prepare the tortellini according to the directions on the package. Drain and rinse with cold water and drain again. After placing the tortellini in a bowl, add about ½ cup of Italian Salad Dressing. Stir. Optional ingredients to add: garlic powder, chopped onion, chopped parsley, sliced black olives – according to taste. Cover and refrigerate for at least 3 hours stirring once or twice. Before serving stir and add extra Italian Salad Dressing, if needed. Yummy!!! Cover and refrigerate any leftovers. Soon during the month of June the strawberry fields here in Western Massachusetts and in Northern Connecticut will be filled with the ripening, red, delicious berries. It will be Strawberry Shortcake time! This is a wonderful dessert to make and to surprise your Dad with on Father’s Day! 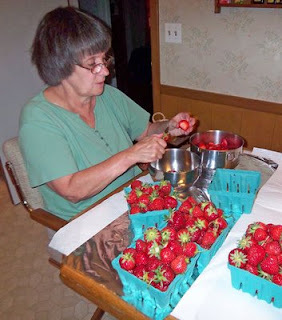 If the fresh local berries are not ready to be picked, frozen and defrosted strawberries or strawberries purchased in the grocery store can be used. Fortunately, we have two frozen packages of local strawberries that were prepared and placed in our freezer last June. The shortcake recipe is easy to make and tastes scrumptious! Yummy Blueberry Muffins are another mouth-watering dessert to prepare for Dad. These tasty muffins can be enjoyed any time during the day. Craisin Raisin Oaties always bring the question of eating just one without reaching into the cookie jar for another. A family favorite for us on any occasion is Cranorange Coffee Cake. It will be difficult to decide which recipe to bake. Fortunately, I have a few days to decide what to prepare. Happy Father’s Day to all Dads!!! A delicious change for lunch is a La Tortilla Factory (click on image)Tomato Basil Softwrap filled with either small pieces of leftover Tempting Tenderloin, shredded cheese and mustard or a wrap bursting with tuna packed in olive oil and shredded cheese. About one year ago while grocery shopping in our local Stop & Shop, packaged softwraps made by La Tortilla Factory were discovered in front of the Deli Counter. Keeping in mind that all too often packaged tortillas loose their soft texture after being filled and then microwaved, my husband & I decided to try this brand. We chose a package of softwraps that were prepared with Extra Virgin Olive Oil. Ahhh, La Tortilla Factory is the tortilla brand to purchase. 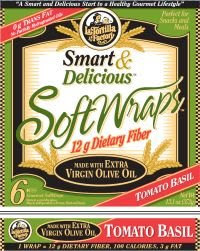 The Extra Virgin Olive Oil Traditional, Tomato Basil or Rosemary Softwraps - we have tried all of them. In addition to the above fillings, ham or turkey with tomato and spinach make mouth-watering cold wraps. What a delicious lunch!!! Last night the animated local weather map showed menacing thunderstorms approaching our Western Massachusetts area within a half hour. That required a Plan B for our leisurely Saturday dinner! The Ziploc container of Sausage Soup had been defrosted and needed to be reheated. A can of College Inn (Light & Fat Free) Chicken Broth was added into the saucepot. The chicken broth was needed, because the rice had absorbed most of the liquid in the freezer container before being place in the freezer. Served along with a Grilled Cheese & Tuna (packed in Olive Oil) sandwich on Oatmeal Bread our quick supper was extremely easy, incredibly tasty and very quick to make. Whenever I prepare Sausage Soup, the extra servings are placed in Ziploc Containers, labelled and then stored in my freezer. My hearty homemade Sausage Soup is absolutely delicious and tastes so much better than the soup with the same name served at our local restaurants. On any evening when a quick supper is needed, a container is quickly defrosted for part of our meal. Quick, easy & yummy! !